Adapted from a play by John Cocking, himself a professional cyclist, the play won a ‘best new play’ award for him, in his home country of New Zealand. 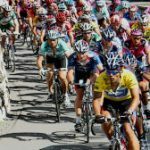 The play is set in the fiercely competitive world of professional cycle-racing and tells the harrowing story of a young cyclist‘s struggle to win the coveted Yellow Jersey in the Tour de France. It is a hard hitting drama, covering a variety of PSHE topics and sports issues – peer pressure, drugs, relationships and choices. Suitable for 13 to 18 year olds.